This website has been superseded by two new sites: a site providing educational resources, Freedom to Believe, and a site that provides access to primary source information about hundreds of prosecutions for religious crime, Caribbean Religious Trials. Both were produced as part of the AHRC ‘Freedom to Believe’ project. For more information, please visit those sites. This site will remain as a resource but will not be further updated. Diana Paton’s book The Cultural Politics of Obeah has won the Association of Caribbean Historian’s Elsa Goveia Prize for 2017, in recognition of excellence in the field of Caribbean History. Diana Paton will be speaking at Birmingham University’s Modern and Contemporary History Seminar on 19 October 2016 on the theme ‘Objects, Rituals and Money: Everyday material cultures and the Prosecution of Spiritual Healing in the Anglo-Creole Caribbean’. Details here. In July 2016 the UK Arts and Humanities Research Council agreed to fund a project entitled Freedom to Believe: A Theatre in Education Project on Caribbean Social and Religious History. 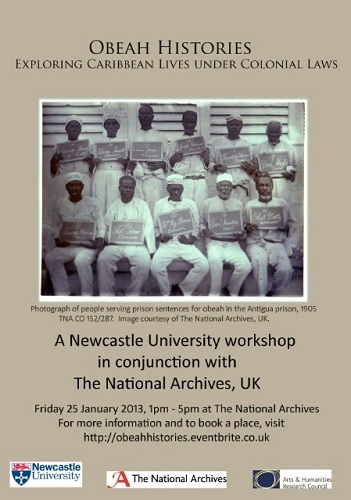 The project is a collaboration between Diana Paton and Gemma Romain, who produced this website, with Talawa Theatre Company, the National Archives the Windrush Foundation, and secondary schools in Newcastle Upon Tyne, County Durham, Leeds and London. It will include a substantial new website which will present more information on obeah prosecutions. Watch this space for more information. Diana Paton’s book, The Cultural Politics of Obeah: Religion, Colonialism and Modernity in the Caribbean World was published by Cambridge University Press in August 2015. Click to buy from Hive or Amazon. Diana Paton’s article, ‘Witchcraft, Poison, Law and Atlantic Slavery’, published in the William and Mary Quarterly in 2012, has been jointly awarded the Lester J. Cappon award for the best article in the William and Mary Quarterly in 2012. On Saturday 15 June we ran a workshop, hosted by the Windrush Foundation, at Lambeth Town Hall, Brixton Hill, London SW2 1RW, on the theme of Obeah Cases in Caribbean Courts. The workshop was part of the Windrush Foundation’s project, Liberation 1838. The Jamaican parliament has recently approved a bill to amend the 1898 Obeah Act. The amendment removes whipping as a punishment for conviction for Obeah. It is one of three laws which will remove flogging as a punishment from the Jamaican judicial system. The amended law will retain the crime of Obeah, but two Jamaican Senators have indicated that they may propose a law to decriminalise it. See Diana Paton’s letter to the editor of the Jamaica Observer and her article ‘A Legacy of Emancipation‘ in the Stabroek News for her comments. The Obeah Histories project held a workshop, Obeah Histories: Exploring Caribbean Lives under Colonial Law, in conjunction with the National Archives on Friday, January 25th 2013. Participants explored histories of Caribbean religion and its suppression from the eighteenth to the twentieth century, examined original archival documents, and looked at images from The National Archives’ Caribbean through a Lens project. The session focused on Caribbean people’s practice of African-oriented religion and healing. We will be running a similar the workshop in June. If you would like further details, please use the contact us page.